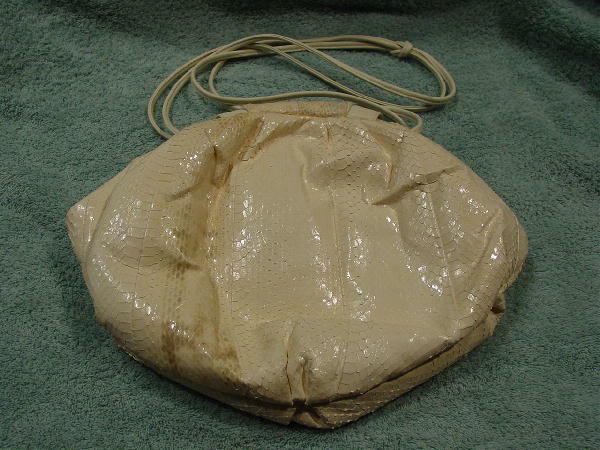 This vintage snakeskin purse is in a freeform oval shape. 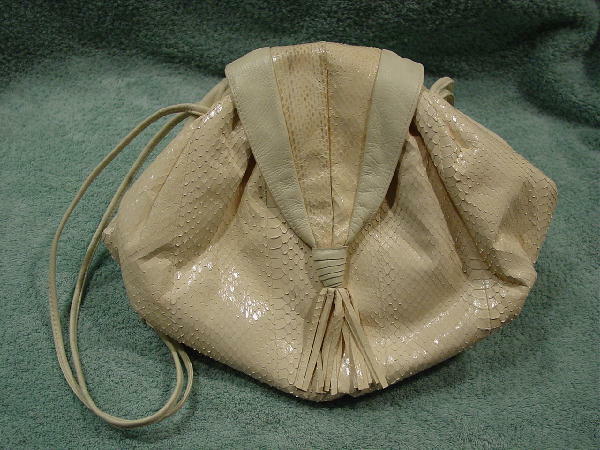 It is in a pale creamy buff and honey-beige snakeskin and bone leather. The top opening has a hinged wide mouth with a cover flap with a magnetic closure underneath and a 3" fringe extending from the bottom. The roomy interior is in a buff vinyl with one zipper pocket, lined in fabric. Below the Magnum tag is a scuff mark - the model had her name written in the purse and rubbed the ink signature to make it illegible. There are double shoulder straps knotted together in the center. A French model sold it because she needed the money. handles are 9" high (overall length of each 20"